Russell is the best looking and smartest JRT ever! I'm biased of course, but we cannot take him anywhere without people smiling and telling us how handsome he is. He just turned 4 yrs old this month. I grew up with Airidale Terriers and they were smart. But this guy is brilliant. Just brilliant. Pictures don't do him justice, but he is the best! Sweet, innocent, relaxed. lol Looks can be deceiving. I just happen to catch him in a relaxed moment (and he does have a lot of those). For a JRT, he is pretty relaxed, but that ain't saying much. He will fall asleep next to you and always has to be pressing against you. But....a bird chirp or any scent he picks up (which he does routinely from VERY far away), and he is in hunting mode and does not hear me or know I'm there any longer (unless I tell him "let's go hunting"). This is the best dog in the world (and I've had a lot of dogs). 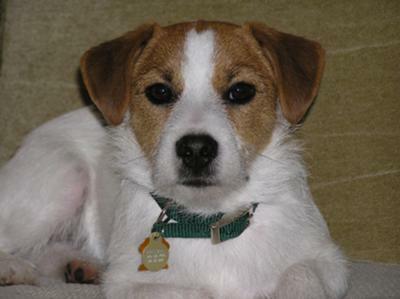 Something about a JRT just makes everyone smile, and Russell is definitely no exception to that rule. I'd like to breed Russell. He has all his papers and his grandfather was a champion. Where can I learn more about making him available for stud service? All we would want is first pick of the litter. What a sweet little face. He reminds me of my Walter with his broken coat. Just makes me smile. Russell is a lovely looking dog, and he looks so relaxed,and content with life.